This was the episode to win me over. It might surprise exactly none of you to discover that I am a huge Supernatural fan, and I love procedurals. So it was with some glee that I discovered that Sleepy Hollow would be following a ‘monster of the week’ plan for the foreseeable future. Do you know what I’ve had enough of? The bumbling sidekick. Do know what Sleepy Hollow avoids? The bumbling sidekick. It’s actually great, because Lt. Abbie Mills knows a lot about some stuff, and Ichabod Crane knows a lot about the other stuff, and they support each other. Plus, they have romantic interests, so there isn’t the threat of them getting romantically involved every ten seconds! IT’S GREAT. That being said, sometimes Ichabod is a know-it-all. Secret entrance to the archives? Mmhm, sure, okay, I guess so. Tons of witch knowledge imparted by your in-limbo wife? I guess I’ll let that slide too. But I’m getting ahead of myself. I didn’t mention the betrayal of Andy (John Cho) last time, because it wasn’t terribly important. However, this week, he gets to come back and hang out again, albeit with a strange neck contortion. I guess the theory was that his head gets knocked back so hard it flips back, but I’m trying to figure out where the extra vertebrae are from to make that position possible. I did like that they kept the skin folds around when he gets ‘fixed’ though. That was kinda nifty. 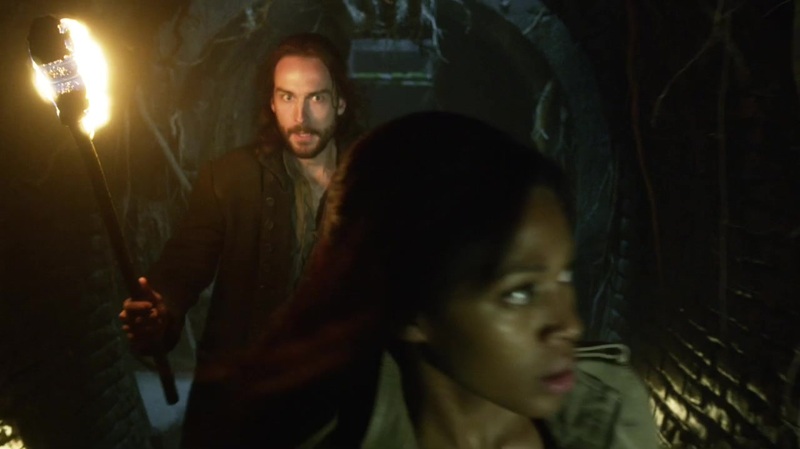 If there’s anything that’s going to get in the way of Sleepy Hollow it’s that 40 minutes isn’t a lot of time to establish a large overarching back plot (the Apocalypse) and the various minions that are springing up (burnt witch, this episode) without getting a little clogged up. I think once we get a few episodes in that will clear up, as the need for explaining everything will lessen. This week’s monster was a witch, burnt at the stake, but not before cursing the law that condemned her. She is able to resurrect herself and regain strength by murdering the ancestors of those who wronged her. Let me tell you – they did a great job making a burnt witch character. It’s super unnerving. I like that the show is taking some ‘gore’ risks, especially in the wake of Hannibal criticism.